Split the team into two groups. Instruct each group of players to line up outside the grid facing inward on two adjacent sides of the area (half of the group on one side, the other half on the side next to the other group). 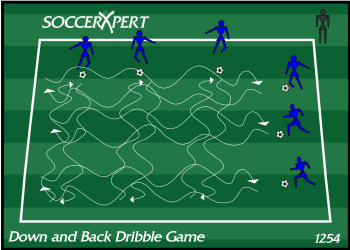 On the coaches command, instruct the players to dribble to the other side of the group and back to the starting position (down and back). The first player back in each group gets a point. The first player to 5 wins that set. Make sure players keep the ball at a close/safe distance. If the ball is too far in front of them they will most often hit another player or lose their ball.